Michael: The traditional superhero narrative can boil down to “hero is on top, villain arrives and takes over, hero defeats villain and the status-quo is restored.” There will be a period — however long or brief — where the villain has won and all hope is lost. Instead of showing a gradual build to that moment of defeat, Batman 41 starts us off there. Instead of opening with the first act optimism of A New Hope, Batman 41 goes right for the bleak Empire Strikes Back act break. In his 40+ issues of Batman, Tom King’s best written villains have been the B or C-listers. He took Bane seriously, making him a force of nature. He engineered the punchline villain Kite-Man to be a tragic punchline. Now King is trying his hand at Poison Ivy, making her a more powerful and dangerous threat than she has been in recent memory. 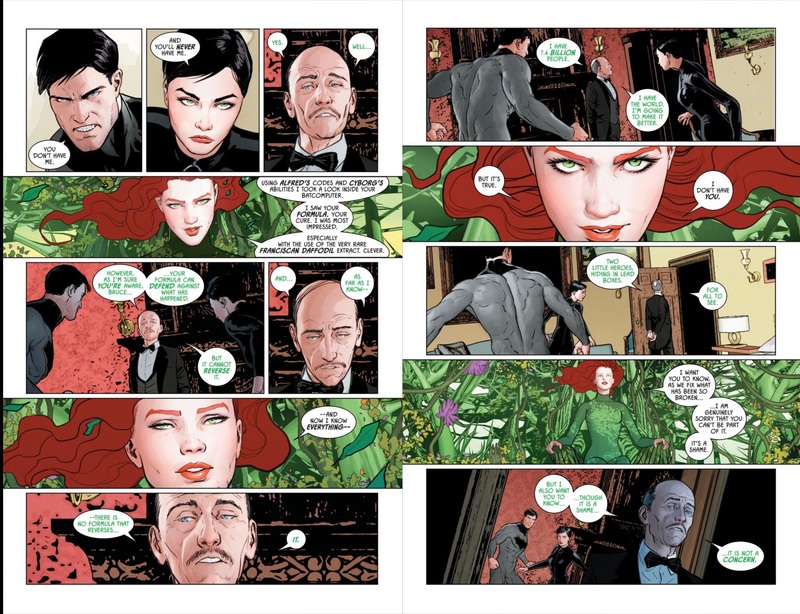 Mikel Janin opens Batman 41 by drawing a statuesque Ivy staring directly at us, having a casual conversation as if she coincidentally ran into us at a dinner party. Ivy’s words hang in the air via caption box, as if you can hear her voice in your head. With this, her spell has begun — in fact it’s already taken over. Through a possessed Alfred, Ivy tells Batman and Catwoman a story about The Joker trying to best Superman by hiding hostages in lead boxes where he can’t find them. This tale is part homage and part parable: Joker was thinking one-dimensionally, where Superman was focused on a bigger picture — he “saw what he could not see.” Ivy is focused on the bigger picture, both in how she bests Batman and how she saves humanity. By concocting a formula to defend against Ivy’s spell, Batman is putting up his own ineffective lead boxes — they’re successful in the short term, but fail to make a larger difference. Batman is playing the old game while Ivy has cooked up something entirely new. 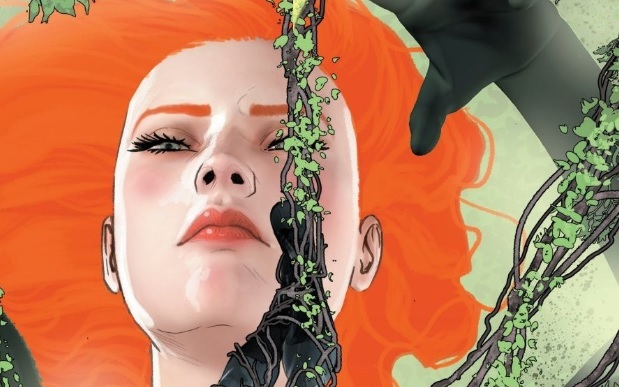 Poison Ivy is at a level we don’t see too often, granting her godlike ambitions and powers. There’s a very Watchmen feel to the issue. Like Adrian Veidt’s master plan, Ivy’s control over the world has alreasy been put into effect before the heroes can stop her. 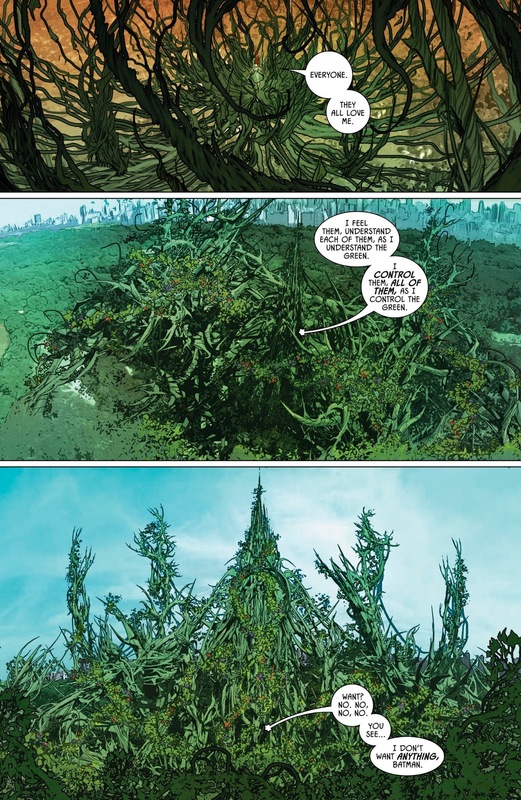 Janin evokes the splendor of Doctor Manhattan’s glass tower on Mars as Ivy bends the surrounding flora and fauna to her whim. With her hive mind control King has turned Ivy into a natural equivalent to The Borg or Brainiac. She is the conqueror that wishes for a better tomorrow. A similar display of power is how Ivy (presumably) takes control of Bruce and Selina to have them slip in their hero suits before they fall asleep again. This reaffirms that she knows their identities and that they are almost completely at her mercy. King has given us various examples of Bruce and Selina’s undying love, but Batman 41 might have one of my favorites. As a man who routinely runs into chemical substances and biological attacks, Bruce is wired to go into fight or flight mode in emergency scenarios. What’s telling is that after he finishes his inoculation he injects Selina before he injects himself. You could argue that he needed to disarm Selina and secure the area before injecting himself, but I see it as him putting Selina’s life over his. He’s altered that fight-or-flight fail-safe to prioritize Selina’s survival in case of emergency. It may seem like a small gesture, but in the very methodical strategizing of the Batman its a conscious choice to love. Ryan, did you enjoy this issue as much as I did? What do you make of the final page — is this the first time Batman is almost completely unprepared with no idea what to do next? Do you anticipate an answer as to why Ivy has gotten such a power upgrade or does that even matter? Ryan M: I think that the why of Ivy’s immense power is less interesting than what Bruce does about it. As you mentioned, we are not used to seeing an unprepared Bruce. It’s disarming to have him admit that he is at a loss. His “I don’t know” becomes a refrain that gains power with each repetition. Selina is looking to him for the answers, and King knows that the reader must be doing the same. The final moment of the issue is a perfect contrast to the efficiency with which Bruce handles the first phase of the threat. King and Janin have Bruce identify the threat in his sleep, neutralize Alfred, and concoct the cure, all in his boxer-briefs. This is the kind of genius and efficacy we expect from Bruce. He moves with surety and conviction. There is none of that to be had in the closing moments of the issue. The cliffhanger hinges on the anxiety of a situation that Bruce doesn’t know how to handle. King has Ivy state the odds pretty clearly. She has 7.6 billion people in her control, but it isn’t until we see that Bruce is off his game that we can really feel the weight of this. It’s a great opening to an arc. We are in the thick of things and King has ensured that we are anticipating the next issue, if only to assuage some of that anxiety. 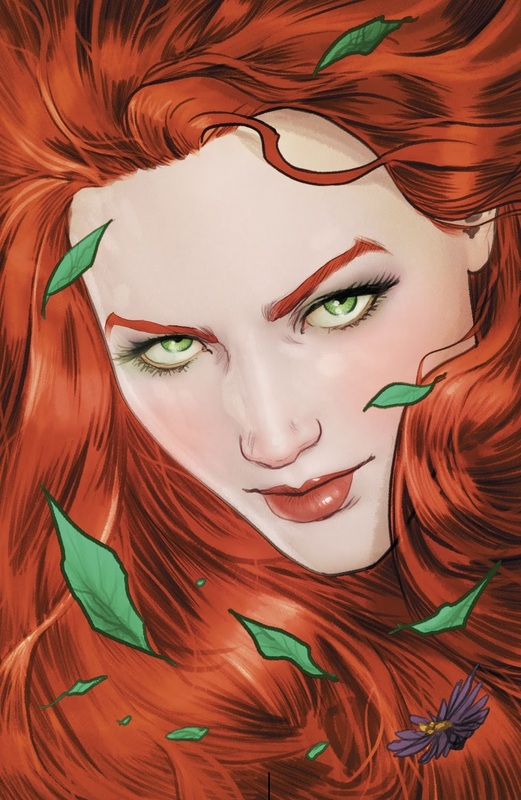 Janin’s art only enforces the sense that Ivy is a formidable threat. She begins the issue looking like a sweet girl in a garden party dress, but ultimately invades every panel with her spreading vines or beautiful face. Sometimes it’s both. 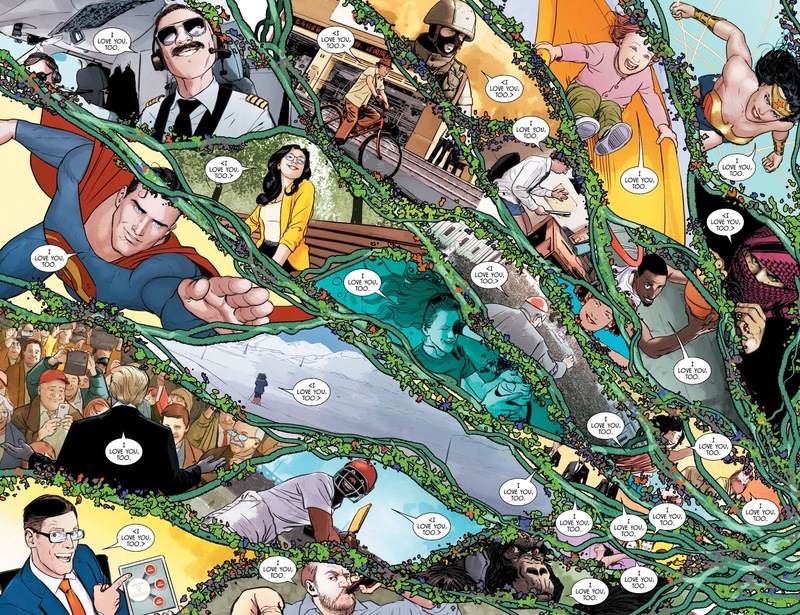 Janin has Ivy pouring into the gutter, her panels bleeding into one another across the page. The scenes in Wayne Manor are far more contained and far less vibrant. This visual reinforces the idea that Bruce had inadvertently locked himself in a lead box, while Ivy rules everything outside. Aside from setting up a Batman vs God conflict, King introduces themes of love and socialization of same. It’s true that Bruce’s choice to inoculate Selina before himself is a sign of his love overriding his pragmatism. In addition to that, Bruce’s behavior is a beautiful contrast to Ivy’s speech of seduction. 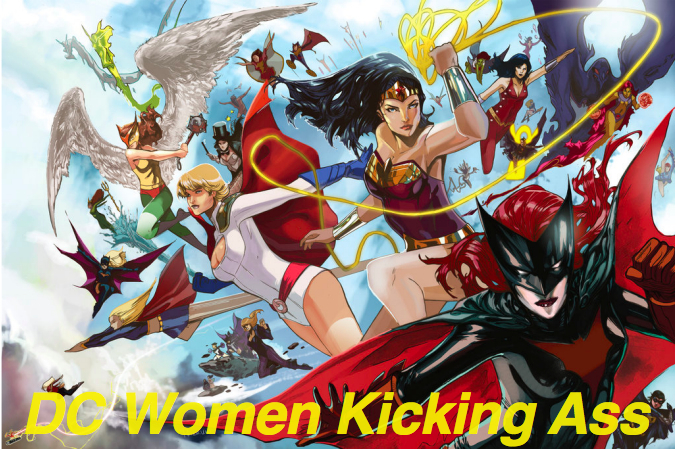 The images of Bruce punching Alfred, fighting and injecting Selina, and ultimately slumping over with the power of the cure, are overlaid with Ivy’s one-sided charm-fest. She plays the coy romantic heroine, full of pretense and cliche cocktail party connection. She spits some “you’re not like the others” game, while saying the same thing to every single person in the world. It reads as commentary on the meaningless weight of this rehearsed sentiment. Halfway through her speech, she even hints at the scripted nature of the interaction, noting “this is where you ask me to dance.” All of this false and treacly talk works on the world. It works on every person (and gorilla) except for Bruce and Selina. This is perfectly aligned with King’s take on their unique relationship which doesn’t reduce them to stereotypical lovers. Their relationship has an element of the two of them against the world. With this threat, that dynamic is made explicit.